Before this summer, 27-year-old Martin Jacobson was already one of the top players on the tournament circuit, having racked up nearly $5 million in live tournament earnings. 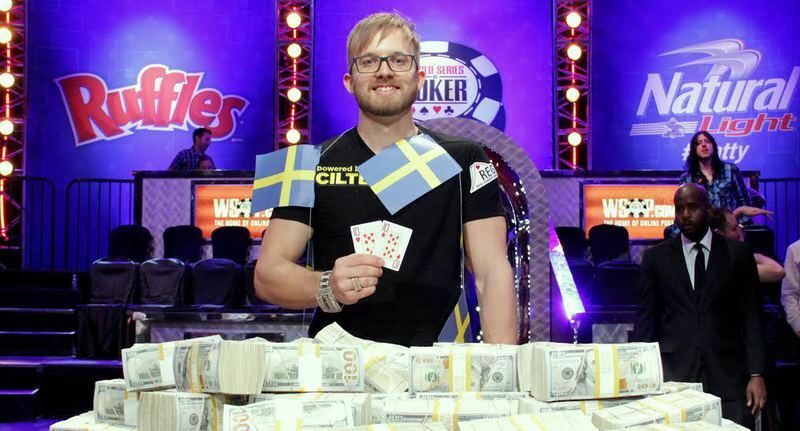 Then the Swedish poker pro went to Las Vegas and won the 2014 World Series of Poker main event, adding another $10 million score to his resume. Card Player recently caught up with Jacobson to discuss his dominating performance at the final table, the preparations he made prior to playing it out under the ESPN lights and cameras in Las Vegas and even why he almost walked away from the game earlier this year. Julio Rodriguez: It’s been a week since you won. Now that you’ve had some time to think about it, how does it feel to be the WSOP main event champion? Martin Jacobson: It still hasn’t sunken in, to be honest, even after a week. I don’t know if it ever will. The whole experience has been so surreal, bigger than anything I could ever imagine. It’s been really tough to process, but obviously I feel really happy with how things went. JR: Have you had a chance to watch a replay of the coverage yet? Some poker players are calling it the best final table performance in a decade. MJ: I watched an edited version of the final table, but I haven’t had time to watch the full broadcast yet. I’m sure it’s all out on YouTube now so I’ll try to do that in the next couple of days. It’s very tough to grade your own play because you are so focused on playing your best in the moment. I really wasn’t concerned with how my play looked overall, but after talking to my friends on the rail and hearing their feedback, I definitely feel like I played pretty well. JR: As one of the short stacks, did you come into the final table looking for a quick double up or were you content to just see how things played out? MJ: I was one of the smaller stacks coming into the final table, but overall, we were all pretty deep when it started. If you look at the chip counts, you could see that one double up would give me the chip lead. I wasn’t worried about my stack, because I started with 37 big blinds, which was more than enough for a tournament with two-hour levels. JR: Looking back at the final table statistics, you played very few hands until Mark Newhouse busted in ninth place, then you changed gears when the final table reached six-handed and then three-handed play. Was this part of your gameplan? MJ: My gameplan was actually to come in and actually do the opposite, believe it or not. In my preparation, based on assumptions of what my opponents would do, we thought everyone would be playing extra cautiously the first few orbits, giving me room to open more pots. But what happened was Tonking and Sindelar got some more chips and began opening much wider than I anticipated on my immediate right, shutting me out of a lot of pots. When you can’t be first in and it costs quite a lot to three-bet fold, you kind of have to sit back and wait for a better opportunity. With the 30-minute delay, I eventually learned just how wide they were opening, so I started three-betting Sindelar and picked up a lot of chips that way. JR: You were perhaps the most accomplished player at the final table, along with Newhouse. Did that add to the pressure and nerves you were feeling, knowing that everyone expected you to do well? MJ: I definitely felt the pressure, but it was mostly coming from myself. I wanted this win more than anything. I’ve been at some other big final tables and wasn’t able to win, and I didn’t want that to happen at the WSOP main event final table, which is usually a once in a lifetime opportunity. I made sure that I was completely prepared. But I wasn’t nervous though, because I realized that whatever nerves and anxiety I was feeling, my opponents were feeling 10 times as much. JR: What kind of preparations did you make for the final table? MJ: The first thing I did in July when I made the final table was to contact all of my friends who I thought had the knowledge and interest in helping me prepare. I got a great response, something like 35 people, and everyone was very helpful. What we did was start to structure a plan of things I wanted to improve in my game. There was quite a lot to be done, obviously. I wanted to be able to set up the actual final table simulation online. We ended up playing about 20 times, with my friends acting as close as possible to the actual players they were simulating. After any interesting hands would come up, we would save it for a later discussion, so that everyone could weigh in with their thoughts about the optimal play. That was a huge benefit to my game, those 500 or so hours of studying and practice. JR: Was there anybody at the final table who surprised you with their play? MJ: There wasn’t really anything surprising at the final table in terms of how the players acted, but I was really surprised with how little my opponents prepared for the final table. Some told me that they hadn’t really done anything and with some others, it obviously showed in their game that they had not done much. JR: You busted Jorryt Van Hoof in third place after calling his all in with A-10 against his A-5. On the broadcast, Antonio Esfandiari said that should Van Hoof shove, you’d be faced with a tough decision and might even fold. Instead, you instantly called. Can you talk about your thought process during that hand? MJ: Three-handed, A-10 is a monster, especially against someone like Jorryt who will open a lot of different hands. He actually wasn’t opening too many buttons three-handed, but he had entered the day with the chip lead and was now the shortest stack with about 30 big blinds. The decision was never to three-bet and then fold. You could see before I three-bet that I thought things over and that was because I was making the decision to call should he shove over my three-bet. So that’s why I snap called, because I already made the decision. JR: There was a report that you nearly quit poker at one point to return to the culinary world. Considering the success you had even prior to the main event, what made you want to quit? MJ: Before the Aussie Millions this year, I spent some time not playing much poker. I started putting together a business plan for a healthy fast food chain that focuses on nutrition. This is something that I’ve had real trouble finding over the years on the tournament circuit, so I recognized that there was a gap in the market. It’s something I am really passionate about because I think a lot of people are not well informed about nutrition and are too often making poor decisions about their diets. I was burned out on poker and during that break, I realized that I was a lot less stressed, just thinking about this business idea. But I played in the Aussie Millions anyway, and kind of fell in love with the game again. I realized I wasn’t quite ready to leave poker behind and obviously its a good thing that I didn’t. I definitely think I’ll return to that business idea someday, but right now, my passion for poker has never been stronger. I’ll be playing a lot of poker over the next year and beyond. After that, we’ll see what happens. JR: During the final table you wore a patch to support REG. Can you talk about why you chose to support that project? MJ: A couple of friends of mine, German poker players Philipp Gruissem and Igor Kurganov, together with a couple of people in the business world, started REG. It’s not it’s own charity, but it does connect to other charities which have been meticulously screened and handpicked. There are a lot of charities out there that are nothing but scams. They pay their executives huge salaries and only a small fraction of donations actually go to helping anybody. What REG does is connect the poker world to those charities that responsibly use their funds. Poker players want to give back and help the world become a better place and this makes it really easy. Hopefully it also helps non-poker players to realize that this community can be one of the most giving and charitable.